Spending tons of time frozen in a block of ice will do things to a guy. It usually goes one of two ways when you thaw out: you either become the leader of the world's greatest superhero team, like Steve Rogers, A.K.A Captain America, or comical antics ensue a la Encino Man. Either way, you might have a hard time adjusting to the modern times. In Steve's case, the world today just doesn't value freedom the same way his generation did. We look up to Captain America's determination to protect freedom, and his best friend. It's something that everyone should strive toward. Now, you might be thinking to yourself, “How do I become like Captain America?” Believe it or not, you don't have to be infused with Super Soldier Serum and you never have to encase yourself in a chunk of frozen ice for decades. 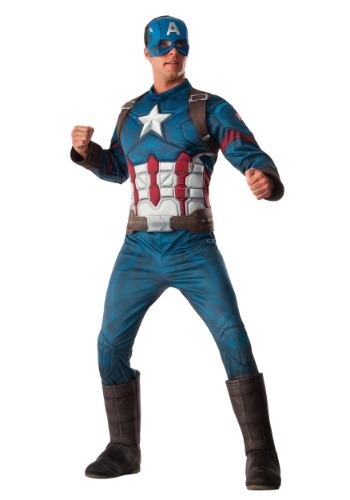 All you need to do is a little bit of determination and this licensed costume!